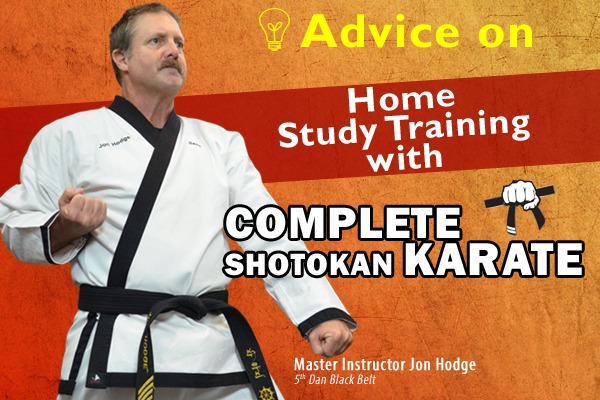 Home Study Training in Complete Shotokan Karate can and should be a fun and exhilarating journey of self improvement. The super benefit of Home Study is being able to progress at your own speed of learning and time allotment. Not everyone has a Dojo close to them and in fact we successfully Home Study train individuals all over the world with different abilities and life situation needs. Understanding your needs in relation to your abilities and life situation is the first step toward successful Home Study. It is a unique feature of Complete Shotokan Karate that one can study this art alone and at any time in almost any place. It is recommended to start out wearing a light training uniform for your daily practice. An area of about 9 feet by 12 feet is appropriate for training and can be reduced to 9 feet by 6 feet if necessary. Home study is best accomplished by reviewing the techniques, one-steps and kata by video and replicating the moves as closely as possible in training. One should not apply full speed and strength until one has learned the basic structure of the technique, one-step or kata. Generally one should review proper technique through the videos frequently to ensure proper muscle memory is created for each technique, one-step or kata. A training partner is a good thing to have, if you don’t have a training partner don’t fret or stress over it. Almost anyone can assist you with one-steps and self defense. It is great fun and learning for you friends and family. Just remember to go slow and use the one-step protocol given in the White Belt curriculum. Another great training method with one-steps and self defense without a partner is called shadow defense. Where you see the attacker in your mind and demonstrate the defensive moves in the air shadow boxing style. Over the years I have personally used this technique and greatly improved my self defense skills. Let us reflect on our abilities and our life situation. For successful Home Study in Complete Shotokan Karate we must know our physical and mental limits. What kind of condition are we in mentally and physically speaking? How much time do we have to train each day, week and or month? For successful Home Study in Complete Shotokan Karate we should create an outline or routine training schedule for each day, week and month. This is a training regiment that reflects your level of training, abilities and time to master the level you are working in. (1) Light Stretching, (2) Physical Conditioning, (3) Technique Practice, (4) Kicking Practice, (5) Special training for the day(Kata, One-Step or Bag Work), (6) Cool Down Stretching. Each individual should gear their training regiment to their physical abilities and the amount of time they have for training. Students need to consider starting out slowly and not overworking their ability and their body conditioning. A slow steady method is best when training. Complete Shotokan Karate has nine diverse training levels. Each student will need to adjust their training to coordinate with abilities, physical conditional and curriculum requirements. Be aware that your physical condition and ability will take time and nurturing. As you progress through the levels you will become stronger and your technique will improve. Over the years I have trained hundreds of wonderful individuals in martial arts. The expectations from one person to the next varies from on fire to just warm in the intensity and focus of training. I have beginning students ask me the first day of class, will we get our black belt next week or next month. When I tell them it will take three to four years of training you can see the energy drain out of them immediately. You see, we are in an age of getting everything immediately and corporations have dupe most folks into thinking everything you need can be bought and delivered immediately. Well folks, self improvement of mind and body takes time and nurturing by the individual who wants to improve him or herself. In training with Complete Shotokan Karate one should not expect perfect results in a short time. Karate training may extend over an entire lifetime. When studying any subject, little will be gained by haphazard training and one should focus on a steady progression of regimented training. Clearly very little good will be gained from training sporadically, heavy training before the body is in proper condition can produce serious injuries. For these reasons train systematically without becoming impatient or overexerting yourself. Learn to train and develop gradually, advancing steadily one step at a time with increased application of force and number of exercises practiced. Many people tire of training within six months to a year. This state of weariness is common and not just restricted to martial arts. During a state of weariness a student may succeed or fail depending on their attitude during this period. Once you are aware of this state, one must redouble their efforts and pass through this period with inspired spiritual effort. Complete Shotokan Karate is a self improvement of the mind, body and spirit. If one becomes discouraged and quits, the entire effort of all things previously done is lost. Once you have begun Complete Shotokan Karate the benefit you may derive from it, it is my hope that you will continue to train thoroughly until you come to fully understand it. Thus a Black Belt is one who has great focus and intent toward his goal and ever strides to achieve it through MIND, BODY and SPIRIT. Three important points should be kept in mind when training in Complete Shotokan Karate, (1) light and heavy application of strength, (2) expansion and contraction of the body and, (3) fast and slow movements in techniques. There are many who believe and practice the application of excessive strength, speed and indiscriminate motion thinking that they are using SKILL in their training. Students must learn to apply strength when called for and not otherwise, and then move rapidly when necessary and slow down when appropriate. The rewards of Home Study of Complete Shotokan Karate are within anyone’s grasp. By training within your ability, around your life situation and with spirit and intent you can become master of life. We encourage you to embark on upon continually improving yourself and become a Black Belt of Complete Shotokan Karate. A Black Belt is someone who does whatever it takes and then applies it to all facets of their life. Bodybuilding 5-6 days weekly about 45 minutes per session. Could this course be a substitute for cardio? If so, would 20 minutes 3-4 mornings per week suffice? I hit the iron in the late afternoons. I recommend doing active stretching first. Such as leg swings, up and over knee ups, torso twists, knee rotations, etc. Then, move into a cardio routine. This routine could be like one of “Fitnessblender’s” low impact routines on youtube. Then, you can do your karate training. Finish it up with static stretching. As long as you are feeling a stretch, holding it for 10-15 seconds, and doing deep breathing, you are guaranteed to increase your flexibility each day. Practicing the Shotokan course as a “workout” 3 days weekly. Each session is about an hour in my basement. I am going to add weights, maybe twice weekly. Would 30-45 minutes of compound exercises be a good method to follow? I am doing this to learn and for self-defense so I don’t think the weights will hurt. I think weight training is an excellent addition to Shotokan workout. In my martial arts journey I have certainly tailored my weight training in accordance with targeted areas of the body. My routines worked arms, chest legs, and so forth where I seem to be lacking. I think it is human nature that makes us all need to hear from someone other than our self that we have completed something correctly. Hearing this approval from others helps us to gain confidence in what we are learning and doing. The best way to do this is to complete your training for the first belt level, which is a goal, then send in your exam video and I will review it and give you feedback. Do not fear failure, I have never had a student fail that sends me the exam video, we will work together to insure that you learn the techniques and gain confidence. Anyone can become a successful student with determination and following through toward the completion of each belt level as a goal toward the Black Belt. I want to learn karate full exercise at home . So what can I do .and learn from what? I am new to martial arts Is there any way to learn martial arts at home without a single penny.plz….